Dúchas, Daingean Uí Chúis. Bhur dTeanga, bhur bPlean. Tá deis á tairiscint ag an rialtas do Dhaingean Uí Chúis a bheith ina Bhaile Seirbhíse Gaeltachta. Tá An Lab, Ionad Ealaíon na Gaeilge i nDaingean Uí Chúis, agus pobal an bhaile i mbun plean. 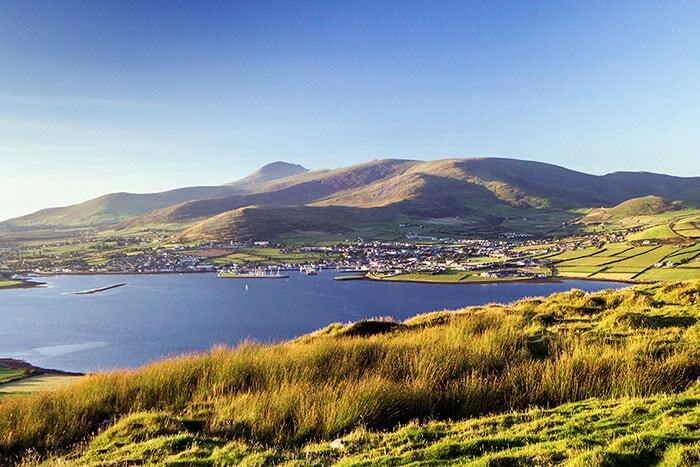 Dingle is being offered an opportunity by the government to be a Gaeltacht Services Town. An Lab, Dingle's Irish Language Arts Centre, is forming a plan along with the townspeople. Ná caill an deis dheireanach do thuairimí a bheith san áireamh sa Phlean! Don't lose this final chance to have your opinion reflected in the Plan! Tá an taighde don bPlean Teanga, a chuaigh i gcomhairle le réimse leathan de phobal an bhaile,críochnaithe. Anois tá sé in am beartanna praiticiúla a dhéanamh amach bunaithe ar seo. Táaidhmeanna agus moltaí ginearálta curtha le chéile ag foireann an phlean bunaithe ar thuairimían phobail. Táthar ag lorg moltaí ó mhuintir an bhaile fén slí is fearr chun na haidhmeanna seoa bhaint amach tré bheartanna coincréideacha a chur sa phlean. Is féidir na moltaí/aidhmeanna a fheiscint roimh ré as Gaeilge agus as Béarla ach brú ar an gcnaipe thíos den dteideal BEARTA. The research for the Dingle Language Plan, which consulted widely with the townspeople, is complete. It is now time to form practical measures arising from this. The Language Plan team have made out general proposals and aims based on feedback from the townspeople. New suggestions are wanted from the public as to the best way to fulfill these aims through turning these proposals into concrete measures in the plan. The aims/proposals can be read in advance in both English and Irish by clicking on the button below entitled BEARTA. Tá deis á tairiscint ag Roinn na Gaeltachta do bhaile Dhaingean Uí Chúis aitheantas a bhaint amach mar Bhaile Seirbhíse Gaeltachta. Chuige sin, is gá plean teanga a dhéanamh. Tá An Lab ceaptha chun comhoirdniú a dhéanamh ar an bplean sin. Bunaithe ar an bplean teanga, cuirfidh an Roinn maoiniú fiúntach ar fáil chun moltaí an phleain a chur i bhfeidhm thar tréimhse seacht mbliana. Táimid go háirithe ag lorg moltaí fé shlite praiticiúla chun an Ghaeilge a chur chun cinn ar an mbaile. The Department for the Gaeltacht is offering Dingle the opportunity to achieve recognition as a Gaeltacht Service Town. To do so, it is necessary to formulate a Language Plan. An Lab have been appointed to co-ordinate that plan. Based on the finished plan, the Department will make considerable funding available to implement it's measures over a 7 year period. We need to hear practical suggestions as to how Dingle's status as a bilingual town can be strengthened.